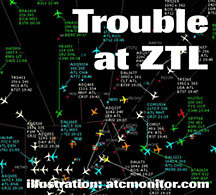 The nation’s busiest air traffic control facility, Atlanta Air Route Traffic Control Center, is currently the site of a dangerous mold and fungus infestation that has reached crisis proportions after sickening scores of employees, adding an extraordinary amount of anxiety and stress to an already difficult work environment and has even led an outside contractor to pull its employees out of the building due to the serious health concerns. Specifically, there is a fungus called Scopulariopsis in the control room. Spores from this fungal source are being dispersed through the air. Fungal samples were taken at the facility on Sept. 20 by Analytical Environmental. According to NATCA Atlanta Center Facility Representative Calvin Phillips, approximately half of the more than 300 controllers in the facility have suffered various degrees of health problems over a prolonged period of time. In July, Atlanta Center’s notoriously leaky roof was exposed before a Congressional committee, which reviewed photos of trash cans placed near controllers’ radar scopes to collect rainwater falling into the control room. But NATCA says that was just the tip of the proverbial iceberg. Years of dampness has caused the mold to flourish beneath the raised floor. The FAA ignored the warnings and pleas of the workforce and issued sick leave abuse letters instead. “We are concerned that the poor conditions at Atlanta Center are affecting the health of employees at the facility while detrimentally impacting the safety and efficiency of the airspace for which they are responsible. The FAA has a responsibility to ensure a safe workplace for these employees. The lack of urgency in correcting this problem is frustrating." Atlanta Center is responsible for the safe flow of air traffic in over 104,000 square miles of airspace encompassing parts of Georgia, South Carolina, North Carolina, Virginia, Tennessee, Alabama and Kentucky, including all of the aircraft landing and departing Atlanta Hartsfield-Jackson and Charlotte’s Douglas International. In 2006, the facility handled over 3.125 million aircraft. The facility is divided into seven areas of specialization and operates 45 sectors. Forget about thinking they are qualified to build any sort of NexGen Satellite ATC system, these guys can't even get the roof fixed. This is what The Decider has let happen to your FAA...we now have rotting centers filled with dangerously disgruntled controllers.